I’ve always loved fortune cookies and reading the messages inside of them. That is until my most recent fortune cookie message. Worst fortune cookie message ever.. and here’s why. At first I liked the message. I thought, awesome! But, the more I thought about it, I realized.. I’m already successful. It isn’t right around the corner, it’s right now. And the reason I’m successful right now is because of how I define success, not how others define it. To me success isn’s an external thing. Money, fame, cars, house, status, investments, whatever. Success to me is health, happiness, feeling fulfilled. All of which I’m fortunate enough to already have, feel, and get to experience. Of course I still have goals that I’m striving for and out to achieve. Personal goals, professional goals, financial goals, relationship goals, big goals, small goals, all kinds of goals. And while I strive to achieve these, I know that I don’t need to reach any of them to be and feel successful. Me feeling successful isn’t dependent on me achieving any of these goals. 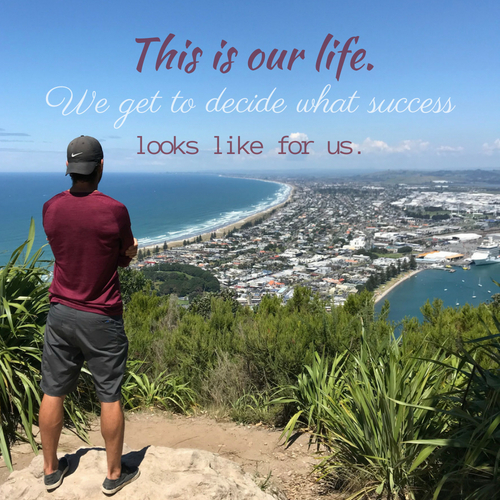 I’m already successful (healthy, happy, fulfilled) and, if and when I do achieve any of these goals, it’s a major bonus that adds to the level of success I already have in place, that I’ve established, that I’ve decided makes me successful. Not by what others deem as being successful. Not by a fortune cookie telling me I’m not yet successful, that success is around the corner. Sorry fortune cookie, but you’re wrong. Success isn’t right around the corner. I’m successful right now because I choose to be based on how I define success. Let’s commit to always defining success for ourselves. Because when we do, we often realize we’re so much more successful than we ever thought or realized we were. Despite what others (including fortune cookies) tell us or have us believing about success. More in this episode of my Mornings With Mike podcast.